I'm just full of spoiler talk lately aren't I? This involves one of the on-set pictures for the filiming of episode 8 of Season 8. I'm pretty sure that's Jon Gries who played the hunter, Martin Creaser who'd committed himself to the mental hospital in 5.11 "Sam Interrupted". I really hope they're bringing that character back, I really liked him a lot. Especially if this is a flashback that shows Sam was actually hunting/doing something to find Dean and Kevin during his year without Dean. Because hey, why not? Martin could have been a resource that Sam could have called on...especially if he'd gotten scared straight back into mental health by the wraith hunting in the hospital with Sam and Dean. Or maybe it's another wraith case that Sam and Dean have to deal with, which I'd love, because I thought the wraith was a really cool foe, making them go crazy and manipulating them with their own greatest fears. I know it's no big deal to notice this, but I love it when they either re-use actors or bring small characters back on the show. Anyways, he looks good, and healthy compared to how he looked in 5.11, so I hope he's still a hunter in some way, shape or form. Oh and Sam, whatever you're doing with your hair, keep doing it you look fabulous darling. I really liked Martin too!!! It will be awesome to see him back. hmmmmm so many things could be going on....Sam?? WHAT is that jacket you're wearing???? So you agree that's Martin? 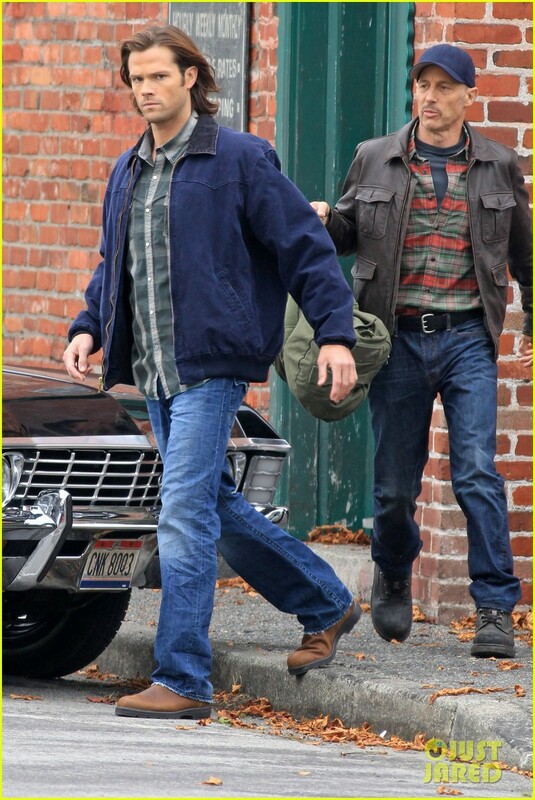 And yeah, that's a different sort of jacket than what Sam normally wears, hmmm. Well, this picture just excites the hell out of me because I *loved* Martin. I love Jon Gries, he's held a soft spot in my heart ever since Pretender. I did too, I hope I'm right, because it would be cool to see Martin come back. I never saw Pretender, just looked it up to see if I'd remember it, just one of those series I missed I guess.